The above quotations reflect a fundamental disconnect as to the ethics of SeaWorld’s use of killer whales or orcas for our entertainment. From the viewpoint of Dr. Dold, the appropriateness of using orcas for these purposes lies in the effect they have on us – i.e., people lining up to be wowed by these awesome animals translates into both commercial and moral currency. But from the perspective of Cowperthwaite, as reflected in her documentary Blackfish, the focus is upon the quality of life for the orcas and the safety of the trainers. The Blackfish narrative centers around an incident that occurred on February 24, 2010, which prompted an investigation by the Occupational Health and Safety Administration (OSHA). 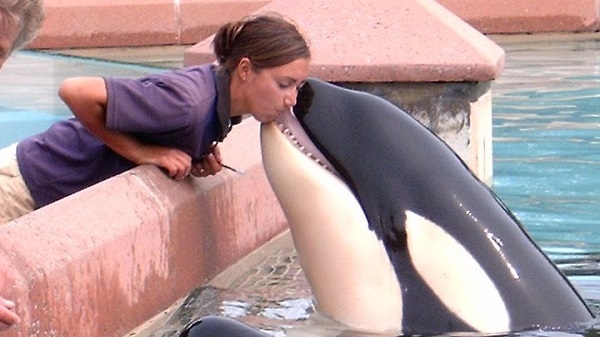 An orca named Tilikum killed a well-regarded SeaWorld trainer named Dawn Brancheau in front of about a dozen dining spectators while she was directing the orca to do tricks in preparation for a show. (NOTE: Blackfish only shows segments of a video shot by a spectator in the minutes before Dawn’s death, and as of the date of this article, videos circulating around the internet claiming to be footage of Dawn’s death are not authentic, but rather videos of other orca incidents.) SeaWorld Parks & Entertainment argued that Dawn was pulled in the water due to the “novelty” of her ponytail, and as such, the incident was attributable to trainer error. After conducting administrative hearings, OSHA disagreed and ultimately required that there be a barrier between the trainers and the orcas during the shows. SeaWorld has appealed the decision. With compelling footage and numerous interviews – including several former SeaWorld trainers – Blackfish not only traces Tilikum’s history from his capture in the wild in 1983, including two prior incidents involving fatalities, but documents several other unfortunate events involving other SeaWorld orcas. The documentary also introduces us to the science behind these animals – primarily, how intelligent and social they are and how they behave in the wild. And although formally relegated to the end of the film, the message is clear and modest: Boycott SeaWorld until it stops using these highly intelligent and dangerously misunderstood ocras for our amusement. The overall effect of Blackfish is sobering and sad. I rarely use the term irrefutable in reference to any sort of documentary. As a natural born skeptic, I am not particularly impressed by the quantum of facts that crowd-pleasers like West of Memphis (2012) omit in the pursuit of demonizing the enemy. In most cases, there is another factual side to “the story,” even if the persuasive weight of each narrative differs in the eye of each beholder. But sometimes the facts are what they are, and the fundamental conflict at stake is philosophical. In this sense, Blackfish succeeds not so much in changing the moral disposition of the viewer, but in forcing us all to pick a side by challenging the notion that there is a middle ground. The pretense that SeaWorld relies upon – that orcas can be trained into mutually healthy relationships with their human captors – is all but obliterated. 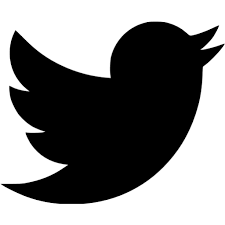 That said, Blackfish barely scratches the surface when it comes to exposing the more general dichotomy of SeaWorld promoting conservation and the environment while simultaneously breeding these animals as a means to rather frivolous ends. To put it simply, the argument that we need orcas confined in a tank performing circus tricks to raise our awareness of just how magnificent these creatures really are is inexplicable and insulting. I’m writing to you on behalf of SeaWorld Parks & Entertainment. You may be aware of a documentary called ‘Blackfish’ that purports to expose SeaWorld’s treatment of killer whales (or orcas) and the ‘truth’ behind the tragic death of trainer Dawn Brancheau in 2010. Lesson #1 in Corporate Public Relations 101: When doing damage control, the strawman is your friend. In any case, SeaWorld’s response seems to miss – or simply ignore – the ethical fruit of the poisonous tree. As far as SeaWorld is concerned, what the captive-born orcas don’t know (i.e., thousands of years of evolution in the open sea) won’t hurt them. Lesson #4 in Corporate Public Relations 101: If the science is not on your side, at least be sure to use scientific terms. Actually, I did not hear the word “bullying” used in the documentary, but no matter. SeaWorld cannot refute the filmmakers’ assertion that the environment of captivity is not even remotely similar to their existence in the wild – much less the painfully obvious point that orcas have hundreds of miles of ocean to escape the [insert whatever term you like for destructive] behavior of other orcas. So where some people say “bullying,” SeaWorld says “raking.” In any case, SeaWorld’s appeal to the evils of anthropomorphizing language is especially ironic considering how integral anthropomorphizing its orcas is to its commercial endeavors. Lesson #5 in Corporate Public Relations 101: When doing damage control, the general denial is your friend. Does SeaWorld argue the two separations of calves from mothers documented in Blackfish did not occur? Nope. Does SeaWorld respond by presenting numbers about how many calves are not separated from their mothers? Nope. 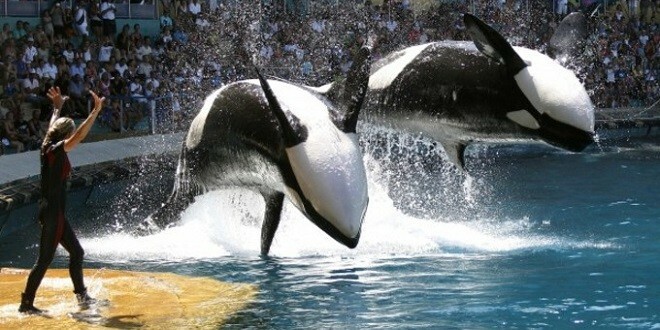 Does SeaWorld argue that these separations would be just as necessary in the wild as they are in captivity? Nope. We are simply told that Blackfish is “misleading” and “SeaWorld does everything possible to support the social structures of all marine mammals” … in tanks and with nets. 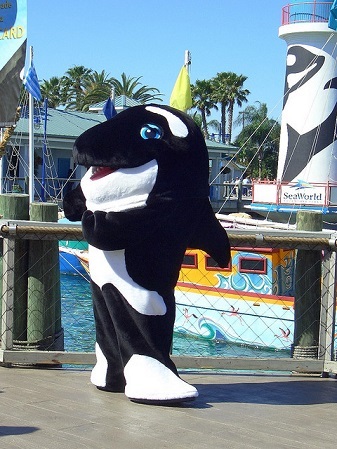 In the film, the topic of punishment-based training is clearly discussed by interviewees in the specific context of Sealand – a park unrelated to SeaWorld where Tilikum was housed and trained after being captured in the wild. (See Lesson #1 in Corporate Public Relations 101 above.) Nonetheless, do the last four sentences of the filmmakers’ response really need to be said? So where would this rogue law enforcement official – who was not a witness to the incident – get all this bad information immediately after the incident? SeaWorld: Certainly not from SeaWorld the company or any of its authorized representatives! In any event, you can see for yourself the video of the initial press conference in question here, which leads us to Lesson #7 in Corporate Public Relations 101: Always be spinning! In the video, right after the Orange County Sheriff’s Office spokesman Jim Solomons speaks, SeaWorld Orlando President Dan Brown took the podium – without correcting law enforcement’s characterization – and simply stated that “one of our most experienced animal trainers drowned in an incident with one of our killer whales this afternoon.” What is particularly notable is that Mr. Brown, accompanied by two heads of Animal Training, immediately took the opportunity to assign a rather innocuous cause of death while neglecting to reveal what would have been obvious to anyone who was present at the incident (even before the autopsy officially cited “blunt force trauma”) – Dawn’s scalp had been pealed off her head and her left arm had been severed and swallowed by the whale. Are lies by omission really lies? Nope. Once more, Mr. Brown concludes: “As soon as we know more information, we will certainly get back to you.” And that brings us to Lesson #8 in Corporate Public Relations 101: When not spinning, always be building plausible deniability. SeaWorld’s Rebuttal – The Conclusion: “These are only the most egregious of the film’s many misrepresentations. ‘Blackfish’ is similarly misleading and inaccurate in its account of the other fatal incidents in which Tilikum was supposedly involved, what happened at Loro Parque, the training and qualifications of SeaWorld trainers, and the care and living conditions enjoyed by SeaWorld’s orcas. And the list goes on…and on. And this brings us to Lesson #9 in Corporate Public Relations 101: When doing damage control, just keep repeating words like “misleading” and “inaccurate” over and over in the hope that someone will start to believe it. SeaWorld does not offer much in the way of controverting facts. Nor does it question the trustworthiness of any of the former SeaWorld trainers whose interviews form the heart of Blackfish. Indeed, if this is the best an official spokesman can do to rebut the assertions made in the documentary (i.e., “the most egregious” of its “misrepresentations”), then the veracity of any of SeaWorld’s characterizations seems to be as suspect as the film suggests. The mere fact that SeaWorld would send the email to movie critics leads us to Lesson #10 in Corporate Public Relations 101: Control the message. So how well did it work out for SeaWorld? As of the date of this essay, Blackfish enjoys an average rating of 83/100 among 30 critics on metacritic.com and a 96% “fresh” rating among “Top Critics” on rottentomatoes.com. Blackfish is in theaters now and is scheduled to air to a much larger audience on CNN in October. Well said. Thank you for this information.